Ballyduff in Ireland-South is a perfect choice for a great holiday or a fun short break in County Waterford. Find out more about Ballyduff below. 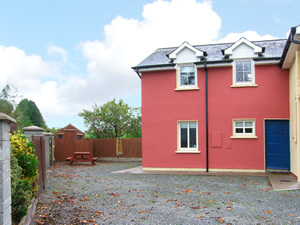 This is one of two cosy homes located on the Cork Waterford border, just one mile from the scenic village of Ballyduff. These cottages are finished to a lovely standard and for larger family get togethers why not also book 12306 (sleeping 7). The area is particularly renowned for its salmon, trout & coarse fishing. Fishing bait and ghillies can be arranged locally. If you want to explore the country side there are a huge selection of riverside walks and tracks through the woods and for the more adventurous the spectacular Vee in the Knockmealdown mountains is only 7 miles away.Shop. Pub. Restaurant 1Ã‚Â½ miles. Beach 17 miles. GF: lounge, kitchen/diner, shower room. FF: double with ensuite shower room, twin.Electricity by meter read, storage heaters, linen and towels included, electric fire, travel cot, high chair, stair gate, TV, dvd player, CD, fridge with small ice box, microwave, dishwasher, w/machine, dryer, uk tv channels, welcome pack, shared courtyard, garden furniture, shared driveway, off road parking. Small pets welcome. Ballyduff is a great base to explore the wonders of County Waterford and you will find plenty of activities near by. Ballyduff is at Blackwater Valley, County Waterford. Check out the map below for directions, use the controls to zoom in. Find Cottage Holidays works closely with independent cottage owners and leading holiday travel operators to provide you the widest choice of self catering accommodation across Ireland. Ballyduff in County Waterford is available through: Imagine Ireland. If you are heading to County Waterford then check out our guides to local holiday attractions, gardens to visit and county shows to see.